Nov. 7, 2018 -- Small children can feel big – and often overwhelming – emotions. So the staff at Fairfax Elementary School is working hard to help children identify and manage their feelings. 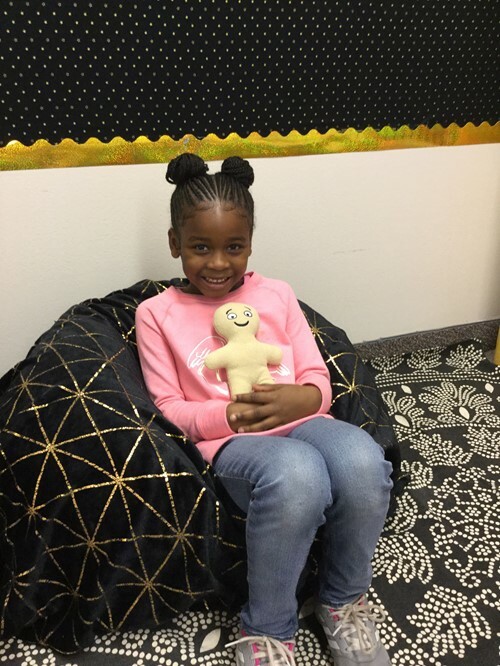 As part of the building’s third year implementing the Conscious Discipline program, the staff is now using the Feeling Buddies curriculum in kindergarten through 2nd grade. Feeling Buddies are stuffed characters that represent eight common emotions, everything from Happy with its cousin Calm to Angry with its cousin Frustrated. Children are able to see how emotions are related and how one (disappointment) can lead to another (sadness). Fairfax guidance counselor Melinda Stoicoiu visits with each of the nine K-2 classes for 30 minutes per week to talk about feelings and introduce self-regulation techniques. Students spend a lot of time looking at details like how someone’s brow furrows or breathing increases when they’re starting to get mad. In Dana Bogus’ 1st grade classroom, the effect of the Feeling Buddies curriculum has been dramatic.